Sandwiched between yesterday’s summit finish and tomorrow’s uphill time trial, it’s tempting to ignore today’s stage. But like all sandwiches, the filling in the middle should the tastiest part. Today’s route is has plenty of climbing and tricky descents in the second half and there’s a chance to shake-up the overall classification. But if this doesn’t happen we’ll see exciting racing on scenic roads. A scenic charge east across the southern foothills of the Alps. The start town of Manosque is a great place for cycling, far away from the more crowded finish in Nice. The race avoids a lot of the best roads but it’s still 220km to go as quickly as possible to Nice. Look at the profile and there’s a long downhill run to Nice. The first part twists and turns and a chase is hard if a group is away but the closer the race gets to Nice the bigger the roads get and the harder it will be for a move to stay away. The final kilometres are flat and smooth along the wide seaside Boulevard des Anglais road. The secret here is to watch the wind coming from the sea and sprint in the shelter of riders. Andrew Talansky lost the lead by attacking yesterday. His three accelerations yesterday helped thin the lead group and had riders and viewers alike sitting on the front of their saddles and sofas but ultimately when he slowed Richie Porte rode away for the stage and race lead. Nevermind the tactics it’s possible Talansky tries to make amends on this stage with some moves. But any attacks from his part will probably be late rather than over the big climbs as there’s a long way from the last climb to Nice. If not Talansky then note others might try too, they can climb up the GC with even a small time gap thanks to the time bonus. More likely is that finally a breakaway will stay away, it’s the last chance for half the bunch to win something so expect a fast start as moves try to go clear. Thomas Voeckler’s won before in Nice. He tried the other day but was too close on GC to be let go, now having lost more time on the overall classification he’s an obvious candidate to try again. Talking of Frenchmen, watch Yoann Offredo as the FDJ rider is suited to long distances and today’s slog could suit him as a test ahead of Milan-Sanremo. It’s hard to pick a rider but remember they need a kick to win on the flat at the end. Weather: rain showers along the way with cool temperatures of 10°C (50°F) rising to only 14°C (57°F) in Nice. A light headwind at the finish is forecast. TV: the schedule changes with the weekend to a later slot of 3.25 – 4.50pm Euro time on French TV and Eurosport and cyclingfans.com or steephill.tv are the go-to sites for video streams. History: in 1955 the peloton left Manosque for Nice but instead of 220km the route was 258km. 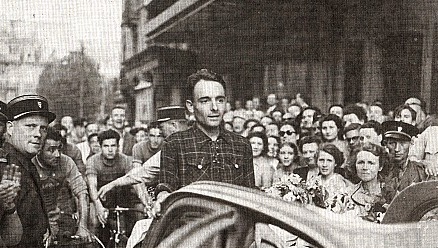 The stage was won by Gilbert Bauvin who almost won the Tour de France in 1956 but was beaten by Roger Walkowiak. Walkowiak’s name has become synonymous with winning the Tour de France by chance, because if such a feat seems impossible, in 1956 a group of 31 riders including Walkowiak escaped on an early stage to come in with 18 minutes on the peloton. Some accounts portray Walkowiak almost freewheeling around France for three weeks with an 18 minute cushion but he had to fight, he lost the lead but gained it back and finally won the Tour after a battle. Ironically this only happened after Bauvin was promoted at the last minute to the France A team, leaving a vacancy in the French B team… which was filled by “Walko”, the the only rider team management could find at short notice. In France gagner à la Walkowiak, “to win like Walkowiak,” became a phrase used beyond cycling to describe an easy win, a fluke. You can feel sorry for Walko here, a man whose name carried an asterisk for the rest of his life, but imagine being Bauvin who ended up losing to the Tour to the man who should never have won? Ride It: the final part of the stage should be familiar to many riders in the race. Some of the pro peloton lives in Monaco and a larger share lives in the surrounding area around Nice. The rain should spice things up. It will be interesting to see if Tejay v G. gives a go. Thanks for the great summary. Another good preview. Enjoyed the history section. Thoroughly miserable day here in Nice. The rain that’s stopped me getting up the Col d’Eze all week is falling again today. But yes! That’s springtime for you! Sun’s out now. Not sure what happened to Yoann Offredo but he’s down as a DNF today, one of the more surprising DNF’s along with Gesink & Kelderman.